Gridgum has always been known for its radio website templates. Online radio has always been our best seller themes. We are known for being very effective in our templates since we provide our customers with a great feature in each one of them. In this WordPress radio theme, we have a black-white style design, but still full of advanced tools that your customers and fans will find really helpful. From the top, we start with different tabs that would direct you to every page you have on your website. This includes browsing programs, contacting you and others. We also provide you a slideshow where you should be able to put HD pictures that highlight your website and attract your customers. After that, we give you the chance to advertise for your top programs. In a 2x3 card design equipped with HD pictures, you will have the chance to promote for 6 different information or music channels that you broadcast on your website. We also give you a tab, just below that, with the VIP party exclusive members. Later, you will have the “follow us on Facebook” that will direct you to any social media account that you have. The template is implemented in WordPress CMS system which means that you do not need any special knowledge in HTML or PHP because CMS is Content Management System and you can easily manage the full site by 1 admin page for the administrator. You can create categories, add new sections or pages with its content, upload or delete content images, insert or delete plugins for WordPress and etc. In the end, you will have the upcoming event tabs to post all your important coming event. And the last thing at your page would be “popular links” which is basically a shortcut to your main menu and programs. Do not forget that our templates comes with one month of free host and include all HD pictures that you see on this preview version. NOTE: TEMPLATE PACKAGE INCLUDES ALL ORIGINAL IMAGES WHICH CAN BE SEEN ON LIVE DEMO PAGE, BUT DO NOT INCLUDE WORKING RADIO STREAM PLAYER (PLUGIN), IT IS FOR PREVIEW PURPOSE ONLY. IF YOU WOULD LIKE TO USE RADIO STREAM PLUGIN PLEASE CONTACT US. 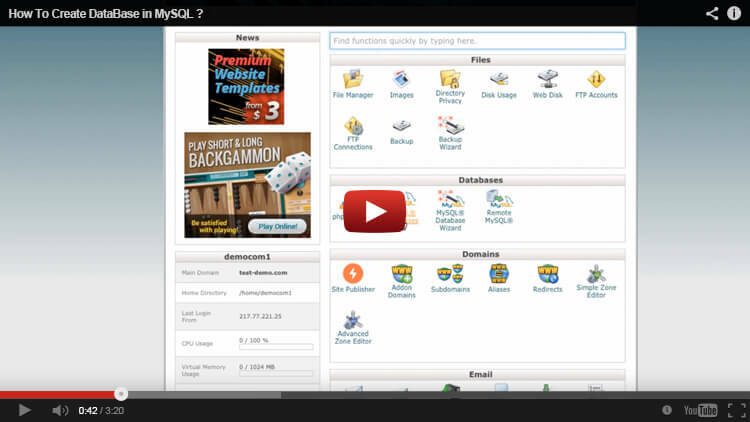 First Step for Wordpress Installation - HOW TO CREATE MYSQL DATABASE ? 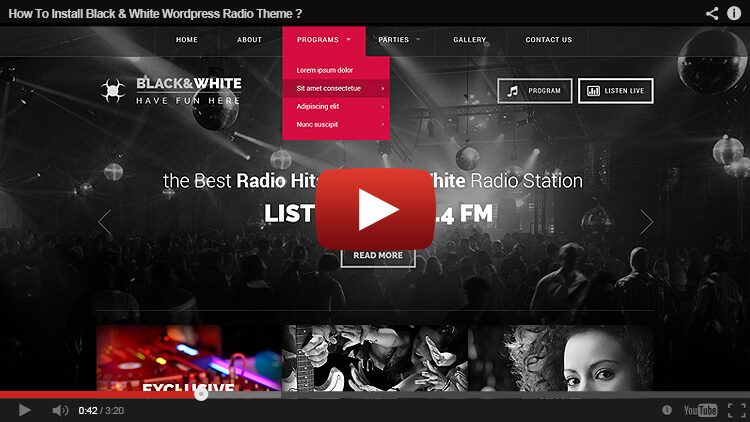 HOW TO INSTALL BLACK & WHITE WORDPRESS RADIO THEME ?